"Use this delicious rub on ribs or chicken. Rub into ribs or chicken and refrigerate overnight." Whisk brown sugar, paprika, black pepper, onion powder, garlic powder, salt, and red pepper flakes together in a bowl. This simple spice rub for pork ribs also works great for chicken and steaks. 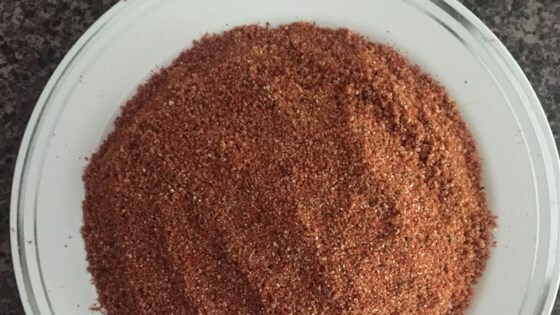 Perfect and simple dry rub. This is very easy to make and leads to tender, flavorful ribs. I like that it is middle of the road in spiciness and doesn't have any odd flavors. The flavor of this rub was nice on baked chicken, however I thought it was much too spicy for me and my family (and I usually like spicier foods). This rub smells so good. I can not wait to use it tonight on our chicken. Loved it. Marinated the chick overnight in a bag with one large lime & water. Was very tender. Pretty much followed the recipe with the following exceptions: used 1 tbl spoon smoked paprika and 1 tbl spoon regular, less black pepper, 1/8 tsp cayenne; 1/4 tsp ginger. Delicious!! this rub is good for literally any meat!!! Made it exact and smoked wings on my pellet grille. 3 hours and turned out fantastic. Sweet and spicy and a little kick every now and then from the red pepper flakes. I made it just as the recipe says. Was great on pork chops. I also used it on roasted sweet potatoes and it was delicious!